So it goes without saying that you need one in your life. Keep it in a visible place in your hallway so you can just take it and go at a moment’s notice. Take it along on a quick shopping trip, on a short walk or, if it’s fancy enough, even to the office. We’ve rounded the top handmade tote bags on Etsy, so consider your research done and just dive into the options below. Finding something you like is pretty much a given. Inspired by nature and by the glorious ocean blue, KATOU is a Berlin-based brand that focuses on charming, high quality and, most of all, sustainable canvas bags and accessories. Minimalistic designs and bold colors are the main characteristics of this brand in general and of this amazing teal tote in particular. 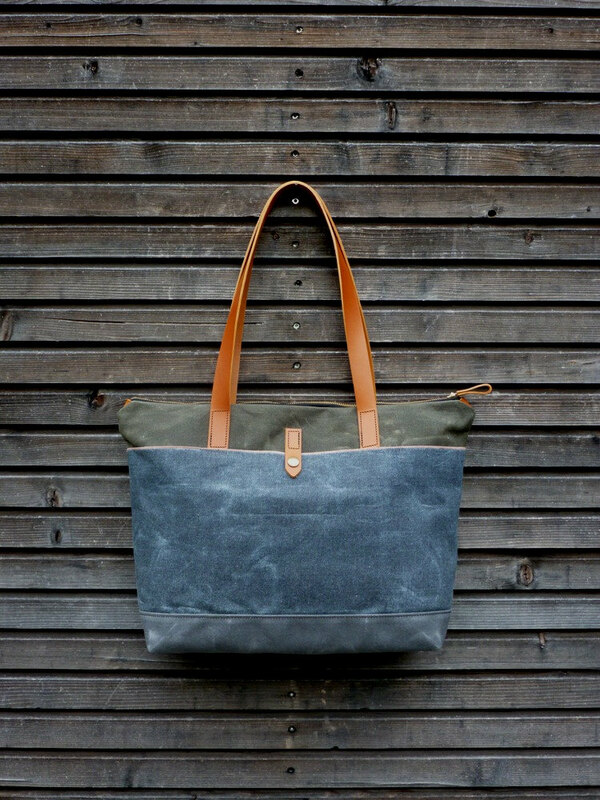 Crafted out of durable canvas, the tote has a neat cream bottom and a beautiful teal top. Plus two leather straps and a matching leather label to finish off the design. On the inside, the bag features a small pocket that will keep all of your daily essentials within reach. Shop it via the link above. Littlewings Designs is a brand dedicated to expert artisan details and timeless quality. They design and create leather goods that will last you a lifetime, and that’s no easy feat. Just look at this cool tote! It was created with a single idea in mind: to dutifully serve you on a daily basis. The bottom is crafted out of un-dyed organic hemp canvas and is generous enough to fit a laptop, books or binders. On the top, a resistant leather strap playfully finishes off the design. And yes, you can choose your preferred color! Head to the link above for more info. Do you want to make a statement with your tote bag? You’re in the right place then. Jiab Berlin produce an array of gorgeous holographic accessories which are just perfect for the urban souls. Check this out: a simple, yet striking tote bag hand made out of artificial metallic leather sourced in Italy. Finished with a simple, white zipper that keeps it closed, this is one accessory that is as eye-catching as it is practical. What a stunner! Shop it via the link above and wander around the shop to see other tote bag designs. MoriStore is the home of nature-inspired tote bags! Each and every one of their products features an original pattern or a seriously beautiful graphic. For proof, look no further than this charmer: with its screen-printed melting pattern, this sturdy tote is the ultimate day bag. Use it to carry school books, groceries, picnic supplies, beach gear or whatever else you might need. Each tote will be made to order, hand sewn and printed, so that the final result will always be unique. Amazing, right? Get yours now! Treesizeverse is a Belgium-based shop centred around handmade, vintage-looking bags and accessories. Just take a look at this incredible tote! Hand crafted out of American, heavyweight waxed canvas, it seamlessly blends 3 colors: olive green for the body, a gorgeous blue for the exterior pocket and charcoal grey for the bottom. On the inside, the bag is fully lined with a blue cotton fabric. And everything is held together with two cognac-colored leather handles. No doubt about it: this heavy-duty tote can easily follow you anywhere. Order it now by clicking above.